It seems like one of the easiest things in the world to cook: You boil some water, throw in some pasta, set the timer for the minutes indicated on the package, add a little oil to keep it from sticking, the buzzer rings and voila! It's done. Throw it onto some plates, ladle lots of sauce on top and you have dinner. Simple, right? And yet, in my opinion, there is no worse mistake in Italian food than soggy, overcooked pasta (and it's far too common). Misconceptions about pasta and the best way to cook it still abound, while methods and tips that Italians consider common knowledge might be news to many. Actually, the only thing adding oil to the water does is prevent the sauce from sticking to the pasta...and wastes oil. Neither of these are things you want to happen. All you need to ensure that the pasta doesn't stick together while it cooks is to a) make sure that there is plenty of water in the pot (see #2), b) give it a good stir or two just after adding it to the water (and occasional stirs during cooking if it's long strands), and c) make sure the water is at a rolling boiling when you add the pasta (see #3). Actually, you do. Recommendations vary, but generally run from 4 to 6 quarts of water for every pound of (dried or fresh) pasta. Why? Well, first of all it helps keep your pieces of pasta from sticking together (see #1), giving them more room to dance around without bumping into each other, so to speak. It also dilutes the starches released by the pasta more, so that you don't get a really gluey pasta water that, again, can cause sticking. 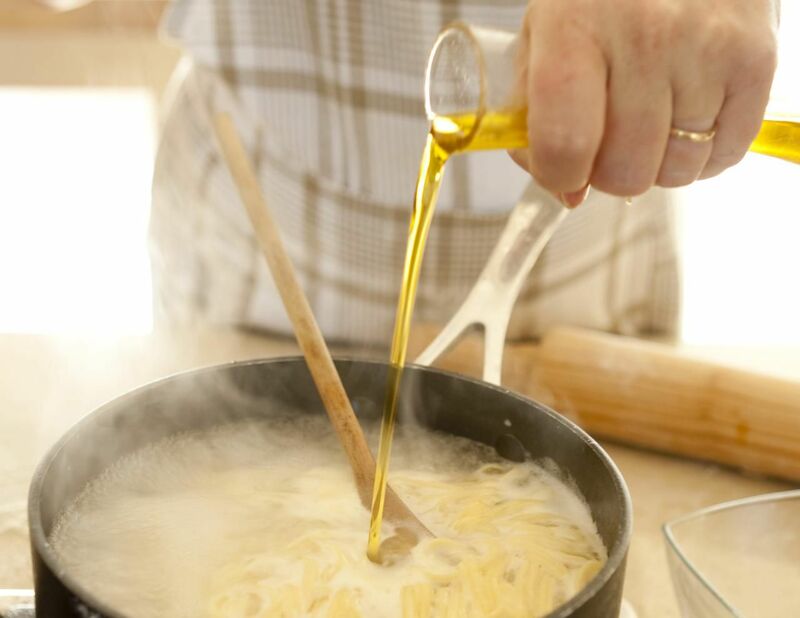 The great cooking science guru, Harold McGee, has conducted experiments cooking pasta, not only in minimal amounts of water, but starting it in cold water (see #3), with mixed results (To read about his tests, see: http://www. times.com/2009/02/25/dining/25curi.html). He concluded that he could (and would) indeed cook pasta in just a few cups of cold water, but the greats of Italian cookery that he invited to join in his experiments, Marcella Hazan and Lidia Bastianich, were not quite convinced, and I am inclined to agree with them. It is worth the extra time it might take to boil a few extra cups of water if optimal taste and texture are important to you. With all due respect to Harold McGee (whom I admire greatly), I believe that it does. It helps to prevent your pasta from sticking together, when you first add it and during cooking, and helps it develop the proper full, nutty flavor that good pasta will have. Many don't see the point in salting the cooking water, thinking that just salting the pasta after cooking (or salting just the sauce) achieves the same effect. But this is one point all Italians can agree on. If you don't salt the cooking water -- and not just with a light sprinkle, but liberally, so that it "tastes like the sea" -- your pasta will be bland and flavorless. Its inherent flavor will just not develop in the proper way. How much? It's a matter of taste, but in general, about 2 to 3 tablespoons of coarse salt (sale grosso) per 4 to 6 quarts of water (about half that much if you're using fine salt, though coarse salt is the traditional choice for this purpose). This one is a "yes and no." You do indeed want to drain the pasta thoroughly. However, you should retain some of that starchy pasta cooking water...it's quite valuable for thinning sauces (particularly thicker ones like pesto, or ones that have been refrigerated and that you are reheating) and helping them adhere perfectly to your noodles. I've found that the easiest way to do this (and not forget) is to place a small bowl under my colander in the sink before I even start cooking, so that as I drain the pasta water through the colander, some of it is automatically retained in the bowl. Then add a spoonful or two as you toss the sauce with the cooked pasta before serving (I usually dump my drained pasta back into the same pot that I used for cooking it for this step), adding a bit more while mixing if/as needed, until you achieve the perfect consistency. I always retain some of the pasta water just in case I need it -- you won't always need it, and if you do, you probably will just need a touch, but it's good to have it on hand in case you do. No way to get it back once it's gone down the drain! There's really no need to do this unless you are planning to use the pasta in a cold pasta salad. Otherwise, you're just rinsing away precious starches and again, your sauce will not adhere as well. In keeping with the general American belief that "more is better," many pasta cooks in the U.S. are quite heavy-handed when saucing it, drowning the noodles under several cups of sauce per serving. In Italy, though, pasta is all about the pasta. Sauces are often applied so lightly that there's just a hint of coating on each noodle. In fact, many Italian cooks pull their pasta off heat just a minute or so before it's quite al dente and finish cooking it directly in the sauce itself. That way the pasta is infused with the flavor of the sauce, without having to pile it on the plate. This one is perhaps more debatable, but there really are guidelines about what types of sauce pair best with which shapes and types of pasta. And those that are mostly made up of individual chunks, such as vegetable-based sauces, work well with short shapes like farfalle or conchiglie (shells). Not necessarily -- they're just different! And just as different pasta shapes work better with different sauces, so certain sauces in Italy are usually served with fresh pastas, while others are considered better for dry pasta (pastasciutta). It might be great fun to fling pasta at your walls and ceiling, but it won't really tell you much about its doneness, and it will probably be a real pain to clean up. To get pasta to the perfect al dente ("to the tooth") texture, feel free to use the time indicated on the package as a guide, but the only way to really tell is to taste it. It should have a firm texture, slight chew, and no whiteness in the middle when you bite into it. It's best to err on the side of caution (there is nothing worse in Italian food than soggy, overcooked pasta), and I prefer to take my pasta off heat and drain it while it's still just a tad underdone...it will continue to cook a bit while you sauce and serve it.